to Budapest and the countryside. Do you prefer to explore the city at your own pace? Do you want to save time having a private guide to show you around? That’s where we can serve you. We are a group of licensed professional tour guides having a car and speaking English. Our private guides offer personalised, private tours to Budapest and to the countryside by car or minivan. Walking tours in the city are also available. As a visitor to Hungary you will want to see some of the famous landmarks and sights during sightseeing in Budapest: the Chain Bridge, the Parliament building, Heroes’ Square, Royal Palace, Matthias Church, Fishermen’s Bastion, Basilica, Szechenyi Baths etc. and explore the countryside like Danube Bend or Lake Balaton. In addition you may want to experience the culture of the nation. Your private guide will take you with her car or a minivan on sightseeing in Budapest or on a customized private tour throughout the country. In Budapest it is possible to make a walking tour. 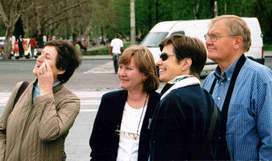 Your highly qualified and knowledgeable tour guide will give you a unique insight into the sites you visit and the areas in which you travel, leaving you with nice memories of your time in Budapest and Hungary. Please choose your tour and your private guide and write her an e-mail. She will answer as soon as possible. Last edited in January 2019.